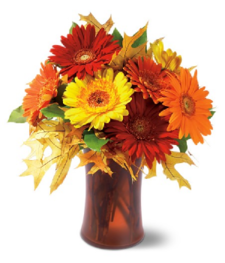 One of the top five most popular flowers in the world is the gorgeous Gerbera. 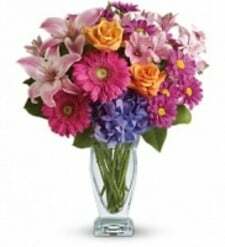 Gerbera is a genus of plants in the daisy family, named for German botanist Traugott Gerber. 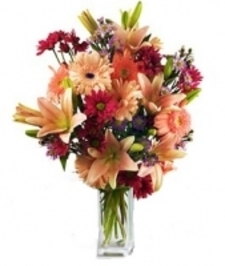 Arrangements that feature lovely gerberas always have high impact and are especially wonderful choices for get well, congratulations, thank you, house warming, new baby, or other cheerful occasions. These species of daisy have a large flower head with striking two-lipped florets that come in vivid colours of yellow, orange, white, pink or red. The same flower can many contain variations of colour in its petals. The flower head (capitulum) is actually composed of hundreds of tiny flowers and can range from small (such as the “Harley” variety) to up to 12 cm (such as in “Golden Serena”). 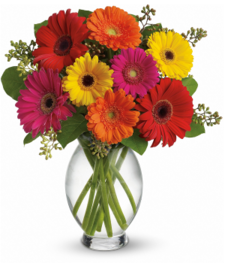 Gerbera daisies are extremely popular. They are cheerful, vivid, and hearty, conveying enthusiasm and good wishes. They are used internationally as a decorative plant in the garden as well as for cut flower bouquets and arrangements. In the garden, Gerbera daisies are perennial and are very attractive to bees, butterflies and/or birds, but luckily, not to deer. 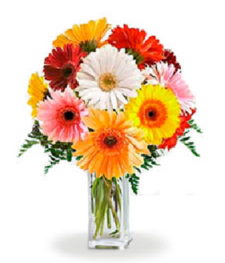 There are many, many bouquets and flower arrangements featuring gerberas that are available at Bloomex for you to enjoy—be sure to check them all out and find your own favourite gerbera bouquet to send!